Tickets available at door starting at 6pm. 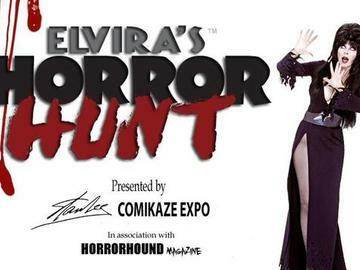 A spectacular night of horror, as the winning short film and feature film from Elvira's Horror Hunt are shown for the first time on the big screen! The event will be hosted live by Elvira, Mistress of the Dark and her partner in crime, Peaches Christ, at Hollywood's historic Vista Theatre. Special appearance by the winning film makers and Horror Hunt judges Sybil Danning and Joe Bob Briggs. Join us on the blood-red carpet for Horror, Celebs and paparazzi galore! The Movie that gave Elvira Nightmares!! FOUND (2012, USA, 105 min) Based on the novel by Todd Rigney, "Found"
PLEASE NOTE: The films are powerful, disturbing and not for children. They are currently unrated and are extremely graphic in both content and tone. No one under 18 will be admitted to the event. The themes and views of these films are in no way endorsed or shared by Comikaze Entertainment Inc. or any of its partners. Comikaze Inc. and its partners will not be held liable for anyone who might be offended, upset or shocked by the content of these films.